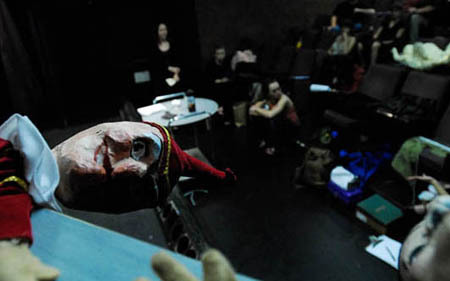 Rehearsing A Grand Guignol Children's Show* (*NOT for Children). Below: group warm ups. BECOME A GUIGNOLER! While many previous Guignolers return, a new ensemble is created for each production's particular needs and we do accept submissions for auditions. Involvement in our productions is unique, demanding, and physical. We look for physical theatre experience/training, ensemble team-playing minded players, high energy, generosity on and offstage, absolute promptness (be in warm up circle 30 seconds before rehearsal call time), discipline (lots of practice, every 't' and 'd' pronounced), willilngness to share production duties (we all sweep, pour absinthe, mop blood), and get dirty. Cliques, attitudes and egos are not what we're about (just the Petits Guignolers). Rather, an inclusive, playful, generous and supportive environment is paramount to our creative environment. We do theatre to create an experience for our guests - not as industry showcase. Mistakes are ok - half assed playing is not. Risk taking is encouraged. Ferocity and strong sense of play is required. We are also a big fan of snacks. TRAINING AND WORKSHOPS: You will not find training lik ours anywhere in Los Angeles. Our Melodrama Workouts are a great one night 'workout' offered periodically (about once a month). Classes are led by Debbie McMahon, Artistic Director of Grand Guignolers. 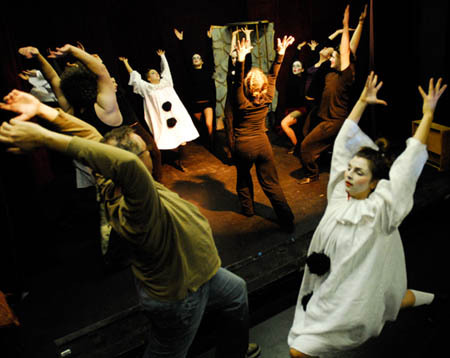 Other upcoming workshops include Melodrama Class Series: The Hands of Orlac and the GRAND GUIGNOL INTENSIVE in Los Angeles and another in June 2012 at Dell'Arte. Click here for more info. BECOME A VOLUNTEER: Please let us know if your interest to participate in upcoming productions and fundraiser events. We can always use helpers! Exchanges for Melodrama Workouts may be made if interested. SIGN UP FOR OUR MAILING LIST. You will have the option to join the show announcement list only or also the Auditions/Workshops list. We do not share our list.